Last week, I told you some of my favorite ways to listen to podcasts. This week, I'm excited to share my favorite shows with you! Again, there are so many out there, but these are the ones to which I do (or did) consistently devote my precious ear time! Cozy up, and let me tell you--in my words--why I love listening to each of these audio works of art! A) YES! What ones do you listen to? B) Okay... I've heard of those. If you answered A... Hello, my fellow podcast listener! I will share my favorites here in just a moment. If you answered B... Granted, I've been listening to podcasts for awhile, but the time I spend listening has increased significantly over time. There is a HUGE world out there when it comes to podcasts, and I truly encourage you to give them a whirl! It's easier than ever to listen, so I'm giving you some suggestions next week! If you answered C.... In the most simple words, podcasts are audio shows (like a talk radio show) you can listen to from anywhere at any time. There are numerous apps and websites you can listen through. There are seemingly infinite numbers of podcasts out there on all sorts of topics in all sorts of formats with all types of hosts! Check out my suggestions on how to listen below, and next week I'll tell you about my favorite shows, which you might decide to give one (or more) a try! First, here are a few general podcast notes--purely at my suggestions. Fave App to Play Podcasts: Stitcher -- While I originally used iTunes and listened on my iPod back in the day, my phone is an Android, and Stitcher is the first app I used to listen on my phone--and I've used it since! If there's something better out there, I'm certainly welcome to suggestions, but Stitcher is my favorite! Where I Listen: Zenon Car (my car) + working out -- My car is my favorite place to listen to podcasts and where I get probably 95% of my podcast listening in. It was previously reserved for lengthier drives, but in the past six months or year, I've had my car always go Bluetooth audio when turning on. (Fortunately, my car is a 2013 model; if you have an older car, you'd probably have to figure out an auxiliary cord, or something like that.) Even though my drive to and from work is only about 10-15 minutes each way, that's that much listening time I get in every day (plus any other drives)! I also enjoy listening when I work out; it gives me an audible distraction from the horror that is working out. Honestly, this one is totally up to preference. Some people listen at home (opposed to TV, etc.). That really doesn't seem to work for me, unless I'm cleaning (maybe). Some people listen at work; I generally end up not listening and missing the content then. I know a lot of people cannot listen while working out. It just depends on what works for you! Where I Find Podcasts: Everywhere! -- As I mentioned above, I'll be sharing my favorite shows next week, so that will be a start if you need some suggestions! However, I've found out about podcasts from all sorts of sources. My fellow podcast-listening friends have given me lots of recommendations. Some celebrities and personalities I was already fans of have podcasts, so that brought me to some of them. Many podcasts also have guests from other podcasts and/or will talk (or post on social media) about their favorites. Social media, websites, podcast apps, and more are just some of the other places you might find out about podcasts. Clearly, I could talk about podcasts all day! Next week, I'll tell you more about my favorite shows! Again, the podcast world is huge, and I can only listen to so much, but I suppose you could say I'm attached with my favorites! I'm writing this from my couch with a cat beside me, the TV on, and a big cup of... WATER. I know, I know. What a basic thing; it's part of the base of Maslow's hierarchy of needs. However, I just LOVE drinking water. Give me a glass of water--with or without ice--at any time, and I am ALL about it. As soon as I get to work. Throughout the day. After a workout (or during, honestly). With every meal. Just for fun. Before bed. ANYTIME, I love a refreshing glass of water. It's delicious. Ahhhhhh! Here in Louisville, I <s>believe</s> know we have absolutely amazing drinking water. I must thank Louisville pure tap® for that. Honestly, it makes me feel a bit snobbish when I travel, because no other water has yet to compare (though I'm certainly not picky). Note: As much as I love water and, honestly, take advantage of the cleanliness of it, there are MANY people in this world--even here in Kentucky (this is worth a read!) --who do NOT have access to clean water. It is truly terrifying, sad, and a shame, and I couldn't post this without at least acknowledging this. I'm not one to pass up an opportunity, but when it's a Saturday during college football season, ALL I WANT TO DO IS WATCH. There's nothing like spending a Saturday at a game or going on a road trip to see one of my teams play. I was born in Ann Arbor, Michigan--to a Michigan football alumnus (my dad) and my mom. From birthday, I have been a fan of the Michigan Wolverines, and my family usually heads to at least one game in Ann Arbor per year. I grew up in Louisville, Kentucky--listening to that same Michigan football alumnus do color commentary for the Louisville Cardinals football games on the radio (and later on TV). That was before many UofL games were on TV, but we sure listened on the radio. When I went to college at the University of Louisville, my mom bought me season tickets at orientation. I think I've missed just one or two home games at Papa John's Cardinal Season since then. There's something about it. The spirit, the tailgating, the rivalries, the fans, the athleticism, the school pride, the ties, the competition, the uncertainty, the home games, the away games, the bowl games, the fun, the family, the friends... the football. You know how I'll be spending my Saturdays for the next couple months. Go Blue! Go Cards! 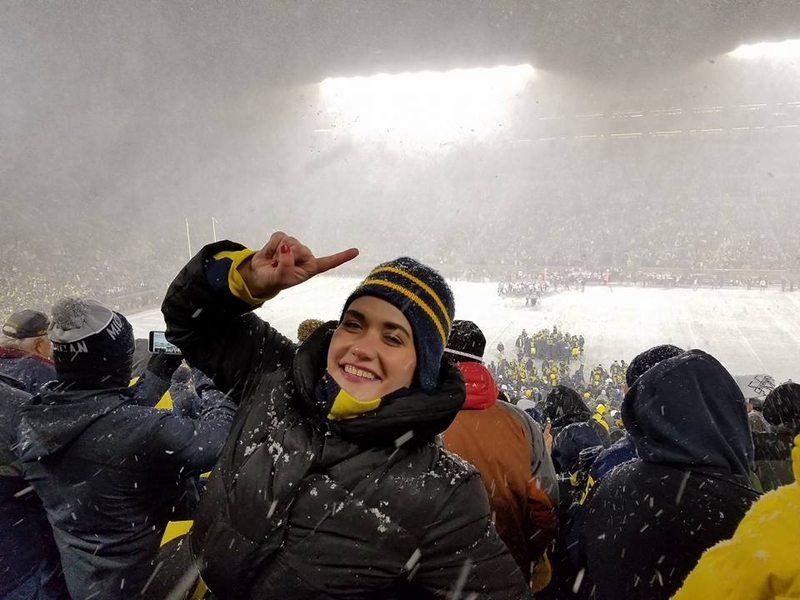 Michigan football vs. Indiana in 2016 -- As you can (or can't) see, there was a little snow. Projects requiring extreme consistency can be difficult for me, because... I don't keep up with them. (Haha.) Just over six months ago, I heard about a project I have consistently done. It's using an app called 1 Second Everyday (1SE). As 1SE claims, "Life is made of seconds." This app has a few functions, but the one I use prompts me to take a one second video every day. Interested in 1SE? You can download it on the App Story or Google Play Store through their website. There are actually some other options/features in the app, but I have yet to mess around with them. I'm anxious to see your videos--and mine! I love to travel. While I truly believe there is no place like home, I absolutely adore getting out and exploring other places--with friends, with family, or even alone! For the past two summers, my friend Daphne and I have embarked on new (to us) cities. In summer 2015, we booked a trip the day before we left to Asheville, NC. It was my first time in a hostel, and we made our way around the adorable small city. Last year, we road tripped to Buffalo, NY for a night before spending the next day and night in Niagara (USA then Canada). Finally, we spent the bulk of our trip in Toronto--followed by a quick stop in Detroit on the way home! We planned on taking another trip this summer, and we tossed around some ideas. However, on March 20, Daphne e-mailed me about something I had never heard of: Pack Up + Go. She told me to do my own research... and that's how this all began! I'm back for my second Friday Fave! This one is what I like to call a favorite "fun fact". Hopefully most of my Louisvillians know this. If you don't, that's upsetting, but at least you're here to learn. When I'm a fan of something, I generally am "all in"! One of my goals of this space is to share some of my favorite things with you--goofy, serious, big, small, well-known, hidden gems, and everything between those. With that, I introduce to you my first Friday Fave! This week, I want to highlight something I seriously love: Yelp!